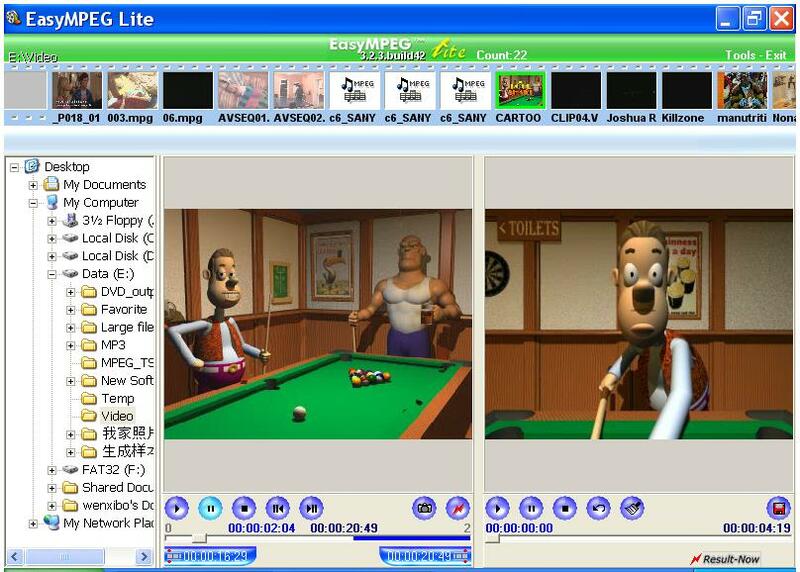 A MPEG/VCD editing tool, included optimized MPEG editing based on the "Result-Now" technique and MPEG Player. EasyMPEG Lite is freeware. Someone said that edit a mpeg file is diffcult and time-consuming, but you will found it is so simple and quick under EasyMPEG™. EasyMPEG's friendly user interface will have you editing and playing video with ease. Integrated with optimized MPEG editing based on the "Result-Now" technique, MPEG Player and MPEG Demultiplex/Multiplex feature, EasyMPEG provides you with the tools that professional editors use, within a simple, easy-to-use interface. EasyMPEG MX is a enhanced version of EasyMPEG Lite. Support MPEG1/MPEG2 PS and PES file. Support DAT/MPG/VOB files on VCD/SVCD/DVD. Support MPEG/AC3/LPCM audio in file. Create a new 600MB mpeg file less than 5min. Demultiplex single stream from MPEG PS streams. Support combine more than one video and audio streams from separate file to a single mpeg file. Included MPEG2 & AC3 decoder(without third-party support). standard MPEG1,2 decode filter for DirectShow. standard AC3 decode filter for DirectShow. support Microsoft MediaPlayer and other software use DirectShow.